Up until a couple years ago, I was convinced I would never be a ring person—every time I put one on it would end up in my bag within the hour. Fast-forward to now, however, and I pretty much always have at least five on my fingers and am forever trawling Etsy for the best shops for dainty stacking rings. I chalk it up to finding a few delicate styles that I could comfortably keep on all day at first, and then I worked my way up to chunkier statement rings on occasion. Mostly, though, I stick to a mix of lightweight midi and regular bands for everyday wear from a mix of independent designers and cool shops I discovered on Etsy. 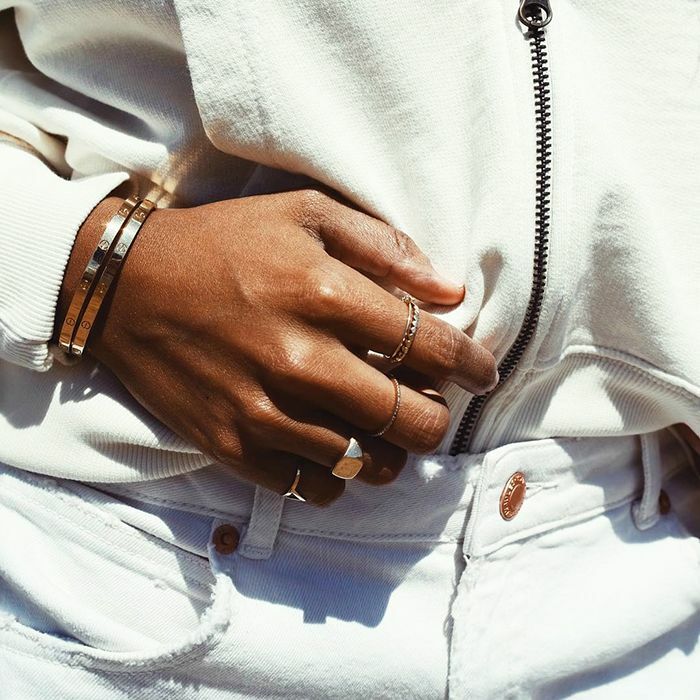 With a little searching, the site is a treasure trove of under-the-radar jewelry brands that make sleek gold sets, layering chains, infinity knots, and pretty diamond and gemstone pieces that aren't crazy expensive. Below, find six of our favorite indie shops to add to your ring collection. Le Cubicule's pretty ring sets make a strong case for mixing metals. 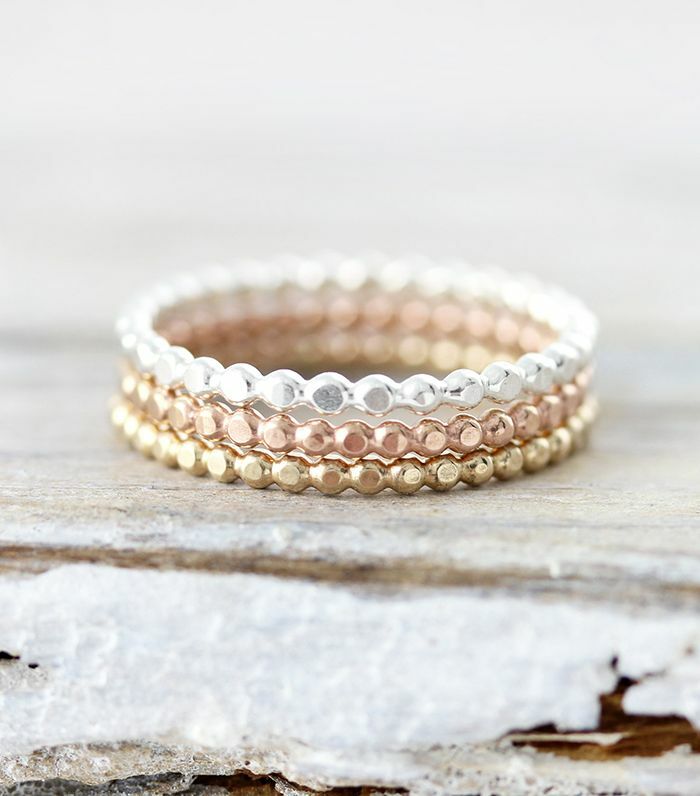 Though, if you're loyal to rose gold, yellow gold, or sterling silver, you can buy each one individually, too. Nuuk Designs' sterling-silver and gold-plated rings are ultra-modern and enticingly well-priced. Layer on a few at a time or wear just one for a clean, architectural look. For delicate, unique fine jewelry, we love Brooklyn brand Liesel Love. Here, you'll find heirloom-worthy diamond rings teeny (and affordable) enough to wear every day. Hannah Naomi makes her minimal yet statement-making designs by hand in Portland, Oregon. Choose from polished or textured rings, and buy one at a time or a whole set at once. Montana-based Etsy shop Laurel Hill has a cool, new-age vibe, with celestial and astrological motifs and talismanic gemstone jewelry. With more than a hundred options of super-simple rings and sleek sets to pile on, you may just become a repeat customer of Aussie brand Bluebirdss. Next up, here's exactly how to clean silver jewelry in three easy steps.